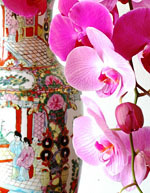 Thirty freshly cut white and deep fuchsia Phalaenopsis lounge in an exquisite porcelain Chinese vase decorated with elaborate scenes of Chinese life. The ornate collages of vibrant blue and red, and the intricate patterns become even more stunning when crowned with the most luxurious arching Phalaenopsis that will last for weeks to come. An unforgettable gift for someone who loves you unconditionally. 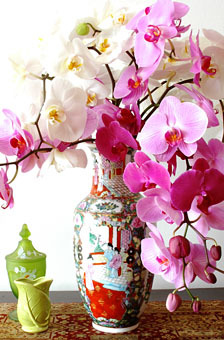 Together, the Chinese Life vase (14.5 inches tall) and freshly cut Phalaenopsis are a perfect accent in a study or on a coffee table. Orchids and vase shipped separately. The arrangement above was created with two dozen perfect stems of freshly cut white and deep fuchsia Phalaenopsis in our Chinese Life Porcelain vase. Each purchase includes care instructions and an exquisite gift card for your personal message. Each stem is approximately 12-15 inches tall bearing 4-8 blooms and comes with individual water vials. The flowers measure approximately 2.5-3 inches in diameter. 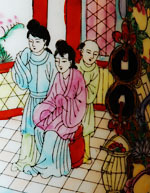 The vase and the orchids will be shipped separately.